Sharp's latest PVR, the TU-TV322H, includes a card for Top Up TV. This subscription add-on can't compete with Sky or Virgin for channels, but you might find it offers a more attractive line-up than basic Freeview, with prices from around £7 per month. It's unfortunate that much of the packaging promotes the now-defunct Setanta Sports, though at least its place has been taken by ESPN. The TU-TV322H has a glossy black casing and mirrored facade, but is otherwise ordinary looking. The front subtly includes numerous controls in case the remote isn't handy. A flap hides the slot for the supplied Top Up TV card (ready for activation) and a USB port that turns out to be useless, for now. The back carries RF antenna sockets, but there is no modulated output, should you try to connect a non-Scart TV. The two Scarts, one with RGB, are the best option here. There is no HDMI output for upscaling to something approaching high-definition and no chance of the machine being ready for Freeview HD, but we wouldn't expect that yet. A green LED display shines through the front panel to show the channel number and name. During playback it switches to elapsed time, though the digits look compressed and the seconds update erratically. The recorder supports Freeview+ features, including dual channel recording, series linking, split event and alternative episode recording, as well as providing a selection of recommended links, which occasionally flag up a choice of related programmes. There's room on the 320GB hard disk for at least 160hrs of TV, with a 500GB version available. If you add Top Up TV Anytime, it partitions the disk to add a selection of programmes overnight. You can deselect channels from these 'downloads' if you don't want certain genres. The remote control is similar to one used by some TVonics products and is itself closely modelled on the classic Sky+ design. The Pause Live TV feature buffers up to an hour of the current channel, and if you press Record Manually it includes buffered content in the recording. You cannot edit recordings on the hard drive, unlike some similar products. 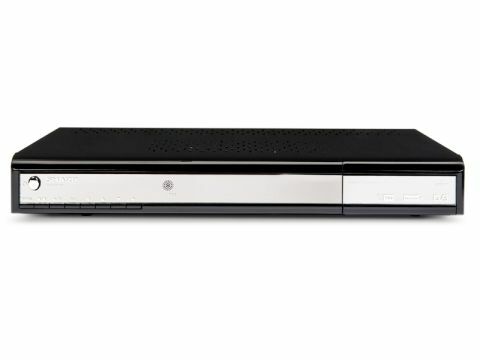 If editing is essential, get a combined DVD/hard-disk recorder with integrated Freeview. According to the manual, the USB port may spring to life after a later over-air software upgrade. In other recorders, USB connections can be used to play or transfer MP3 files and digital photos, and sometimes copy recordings onto back-up drives or burn to DVD via a PC. Initial tuning takes a few minutes, longer than usual because of the inclusion of Top Up TV. Some default settings need tweaking: it outputs a 4:3 picture from the outset, so widescreen users must change this to 16:9. The EPG is preset to a 14-day version that, while useful, does not deliver Freeview+ benefits such as automatic series recording and more accurate Start and End times. To activate it select the eight-day guide in the Customise DTR menu. The guide is informative and simple to navigate. It has a useful search facility that can be filtered by channel, date and time, or confined to programme titles. You don't have to wait for recordings to finish before playing from the start, though you can only find these through the planned recordings menu. Once they have finished they appear in the proper recordings library. There's a Resume feature for returning to programmes you have not finished watching that's accessed by pressing Green in the library, rather than OK or Play. The recorder is sometimes unresponsive, especially when it comes to pausing playback or scrolling through library listings. Recordings are automatically assigned genres and you can streamline the library into these categories if the list is gets bloated. Connection via the RGB Scart reveals this recorder's capabilities. There are no discrepancies between live and recorded programmes, as expected, though our sample did drop frames intermittently during one or two recordings, creating momentary jump cuts every few minutes, but these are probably related to fleeting glitches in the Freeview signal rather than a machine fault. You can fiddle with the playback rates using two slow motion modes and six faster speeds, up to 64 times. The picture quality is crisp and reasonably detailed within the confines of digital terrestrial compression. Colours are a tad muted, especially if you are used to seeing the same channels through an HDMI equipped Freeview box or satellite receiver, but overall it's natural looking. Aside from a brief stutter in the audio at the start of playback, there are no problems to report on the sound side. Coming out of fast forward or reverse is very clean, with no repeat of the faltering at the beginning of playback. With both analogue and optical outputs, it's easy to connect to an amplifier, especially for the 24 digital radio stations found on Freeview. Selling for as little as £125 online at the time of writing, it's pretty good value for a 320GB twin-tuner recorder, especially given its no-obligation option to upgrade to a few extra pay-TV channels.